If you are about to move and dread making several trips back and forth with your car, you might want to consider a one way moving truck. Although a bit more expensive than driving your belongings yourself, one way truck rental ultimately saves time and energy: one trip, one loading/unloading, and one-time stress about parking spaces. Given the high demand at times, one way moving truck rental companies developed elaborate algorithms to better manage their fleet. The goal is to efficiently direct trucks among state, national, or international locations to create a balance and diversity among local fleets, all this while serving customers. This translates to efficiency and higher availability for clients, which leads to better prices. It might seem impossible to anticipate who moves where at certain times and there are many unforeseeable decisive factors: Companies closing down or opening up, natural disasters, etc. However, tracking years of moving activity does reveal certain monthly, annual, or long-term patterns. For example, people tend to move at the end of the month or during summer months – which is why prices to book a moving truck in this timespan are higher. However, the system does have its downsides: trucks wear out faster in a company that uses a strict management system to minimize the time a truck spends in their garages, which means high maintenance costs. Customers can book a one way moving truck in advance and pick it up from the company’s location at a certain time and date. To pick up the truck, customers are required to pay a deposit which usually equals the renting value of the truck and any other booked amenities, if any. The fuel policy usually is full-tank pickup and full-tank drop-off, but it can differ from company to company. After the moving process is done, clients must drop off the truck at the discussed location. The system of one way truck rental is sophisticated, hence the greater expenses for customers. Transporting the truck to the pickup location, communicating with the drop off location, cleaning, and servicing cost the company money. Long-distance rentals are even more expensive because of unavoidable wear and tear the truck suffers, which needs compensation from the customer. We gathered the biggest one way truck rental companies and compared key elements that must be considered when looking for a moving vehicle. For long-distance prices, we considered a cross-country trip of 3,000 Miles to get a quotation. Please keep in mind the listed base price is the minimum you can pay for a truck, but prices vary depending on sizes or availability. Extra services: Loading & unloading assistance; packing assistance; van, pickup truck, and auto trailer rentals; self-storage; moving tips; roadside service; pick up service. Extra equipment: Paddled blankets; boxes and other packing materials; dollies and hand trucks. Local price: $29.99 base price + $0.79/Mile. Long-distance price: $1,696 with a 10-days limit. Extra services: Loading & unloading assistance; van and auto trailer rentals; self-storage; moving tips; roadside service; guarantee. Extra equipment: Paddled blankets; boxes and other packing materials; dollies and hand trucks; tie-downs. Local price: $29.95 base price + $0.79/Mile. Long-distance price: $1,735 with a 9-day limit. Extra services: Loading & unloading assistance; packing assistance; van, pickup truck, and auto trailer rentals; self-storage; moving trailer rental; storage pod moving; roadside service; guarantee. Local price: $19.95 base price + $0.99/Mile. Long-distance price: $2,450 with a 10-day limit. Extra services: Van rentals; moving tips; roadside service; guarantee. Long-distance price: $1,100 with a 10-day limit. Book at least a month in advance. This offers you the smallest price possible since many tend to increase the selling price when they have few available trucks left. 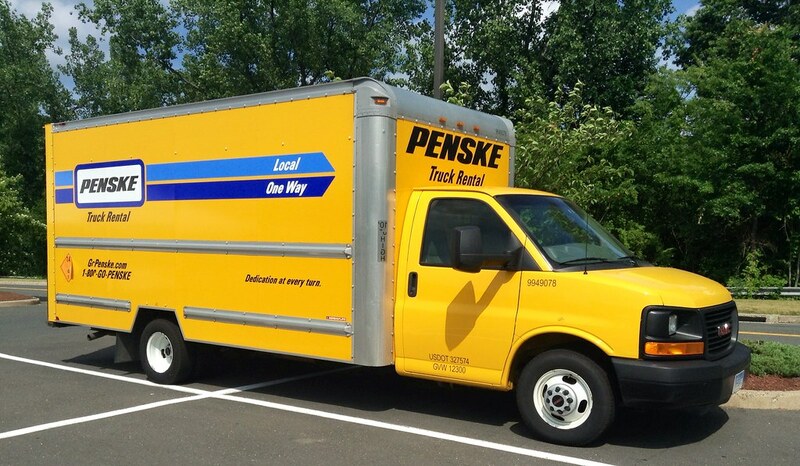 The cheapest moving truck rental you can get will be during a workday from the beginning or middle of the month. Avoid the end of the month. It’s the busiest interval for truck renting companies, which can mean high prices even though you booked a truck weeks in advance. In addition, reservations can be omitted or mixed up. When you are looking to rent a moving truck one way, you need to keep yourself informed on restrictions, regulations, and conditions each company offers. Some allow young drivers to rent, while others require years of driving experience. Here are the most important things you need to find out before making a decision regarding your one way truck rental. Pay attention to the price. Although many companies advertise their local services as $X flat, a fine print will reveal the extra per mile costs. In addition, many companies require a deposit. Reach is just as important as the price, if not more important. When looking for a one way moving truck, their availability in your current and future areas is the first thing you need to check. Enquire on the company’s drivers policy. Budget only allows one driver for their rental trucks, while U-Haul does not restrict the number of people who can drive their vehicles. Make sure it is possible to alternate between drivers before planning to do so. Ask if they are able to provide a trailer. They can be very useful when space is a problem and help reducing costs. You can check our guide to trailers and towing for complete information on how to hitch and tow a trailer. Invest in mover’s insurance. Different than auto or home insurance plans, although can be included in some extended packages, mover’s insurance will replace any lost or damaged items. Carefully read the company’s policy. Some prohibit the transportation of flammable substances, fireworks, chemical solutions – these can include cleaning products, paints, varnishes, fuel, propane tanks, firearms, ammunition, etc. Carefully read your rental contract. The customer can be reliable for tire damage or other normal wears. Tightly pack and secure your items. Furniture, appliances, and tools need special packing like bubble wrap to safely be transported by For sharp edges from gardening tools, a cardboard or plastic protection is recommended. Renting a one way moving truck does require time and certain financial capabilities, but saves a lot more in the end if you carefully analyze your options. Although prices are similar overall, additional services and amenities should make the difference among your one way truck rental options.